visual devices in Language Resource Centres in the teaching and learning of English to Francophone learners of spoken English. Background information on the teaching and learning of spoken English to Francophones students in some secondary schools and universities in Cameroon is sought and presented. 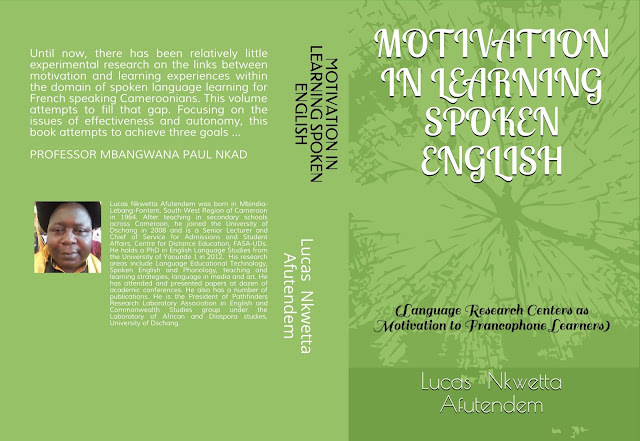 After taking cognizance of the inadequacy in terms of their inability of most learners to use English effectively, the work believes that the absence of motivational strategies could be one of the causes. Two group experiments are then conducted: the Control Group in Language Resource Centres and the other Experimental Group in traditional classrooms. They are evaluated through appropriate testing methods. The results indicate that the learners in Language Resource Centres are more motivated and perform better in spoken English skills than the others in traditional classrooms. This book is divided into five chapters. Chapter One is a General Introduction which consists of nine subsections: The background to the Study, Research Problem, Objectives, Questions, Hypotheses, Introduction of Research Tools, Significance of the Study, Expected Results, Delimitation and Limitations of the Study. Chapter Two presents the theoretical framework and literature review. Here, we examine what previous researchers have said on major aspects of the topic and sub themes. This literature centres on strategies, methods and principles of Second/Official/Foreign language teaching/learning restricting to motivation, performance, Language Resource Centres, CALL, self-access teaching/learning resource materials at the disposal of learners, teachers and language planners and spoken English. Some advantages, limitations and prerequisites of LRCs are presented here. Finally, phonology is considered, limiting to the pronunciation of “s”: /s/, /z/, /ɪz/ and other typical Francophone problematic vowels and consonants. Examples include /θ/, /ð/ or /t/, the pronunciations of -ine, -ite, -oo and the past tense –ed morpheme. Stress is included as a suprasegmental feature. Chapter Three focusses on Research Methodology. The research methods used to arrive at the findings presented in Chapter Four are examined. The design, sample and population are defined alongside the measuring instruments and the methods used to analyse the data. The results of the hypotheses are also presented and discussions made, according to the level of significance. Chapter Four centres on the presentation and interpretation of the findings of the questionnaire addressed to students and teachers. The results of the observation and the test scores of students’ evaluation exercise are presented and discussions made. The hypotheses are then verified and conclusions drawn. We conclude with implications, recommendations and suggestions for further research.